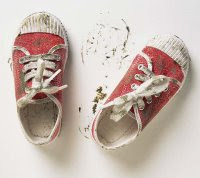 Live Simply Mommy: Take Your Shoes Off! Why is it that my husband and kids can not take their shoes off at the door??? Oh yeah... they don't sweep/vacuum/wash the floors! "About Eighty percent of the dirt in your house comes in through the door on people's feet/shoes." for the record, that's 'love-dirt' on my shoes. special stuff....i got it just for you.